A release of radioactive cooling water from the Savannah River Site near Aiken, S.C. provided the spark for a current research project at Skidaway Institute of Oceanography. The object of the study is to test a mathematical model that can be used to predict the way particular salt marshes may interact with future spills of radioactive water or other contaminants. The story began in December 1991, when the Savannah River Site accidentally released nuclear reactor cooling water containing a radioactive isotope of hydrogen called tritium. Scientists followed the slug of radioactive water as it traveled downstream to the salt marshes near Savannah, where the tritium became affected by the tides. Initially, they found what they expected. Sensors in tidal creeks detected the tritium as high tides pushed it into the marshes, and at low tide it was diminished. After a few days, most of the radioactive water had moved on out to sea. The sensors still detected tritium, but the cycle was reversed. They detected very little on the incoming tide, but higher levels on the outgoing flows. “What was happening was something we really hadn’t thought too much about before this,” said Skidaway Institute researcher Jack Blanton. “It turns out the salt marshes had absorbed a portion of the tritium. Blanton compared the process to a soapy sponge that must be rinsed and squeezed several times to get all the soap out. “The pumping of water in and out by the tide was causing the rinsing and squeezing,” he said. This discovery motivated Blanton and other scientists to explore how efficiently a marsh can detain a tracer like tritium, a pollutant from a treatment plant or any other substance. The 3-year project is sponsored by the Department of Energy through a subcontract with the Savannah River National Laboratory (SRNL) and is directed by Blanton and fellow Skidaway Institute scientist Clark Alexander, along with Al Garrett, Jim Bollinger and David Hayes from the SRNL, and Raymond Torres from the University of South Carolina. The SRNL built a mathematical model to be used to predict this process. The idea is that the model could be applied to any salt marsh area in the world to predict how it would react to the influx of a pollutant. The key to testing the model is to have accurate and highly detailed data regarding the morphology of the marsh. Mike Robinson uses a specially designed small boat with GPS and sonar to survey the Groves Creek marsh. That includes both the topographical (above the water) and bathymetric (below the water) profile of the intertidal marsh and tidal creeks at high and low tide. The scientists selected the salt marshes around Groves Creek, adjacent to the Skidaway campus, for the test. 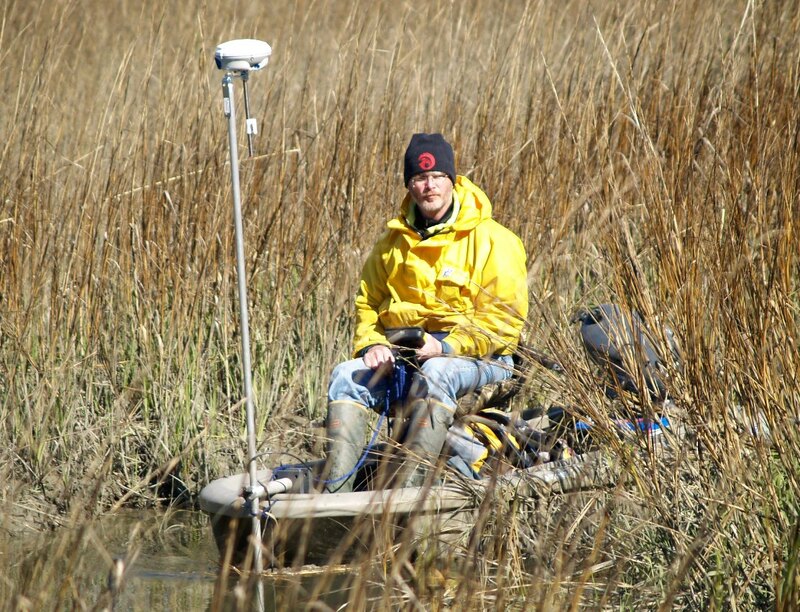 Under Alexander’s guidance, research associate Mike Robinson has been using highly sophisticated GPS equipment to develop an elevation profile of the marsh’s high ground and tidal platforms, and a combination of GPS and sonar equipment to create a bathymetric profile of the creeks and waterways. 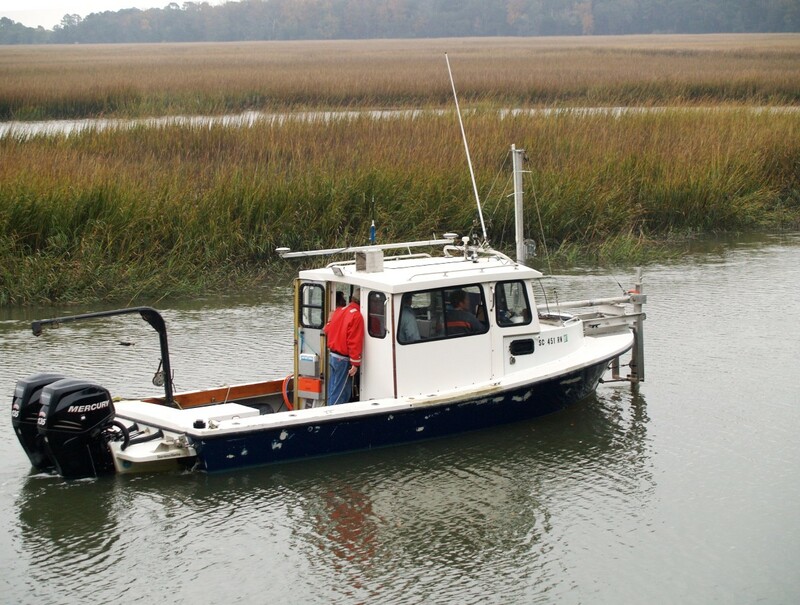 A survey vessel from Coastal Carolina University (CCU) was used to survey the larger creeks in the study area. The crew was lead by Dr. Rich Viso of CCU. The researchers will dump dye into Groves Creek to observe how the marsh imports and releases the dye over a several-day period. This information will be compared to predictions calculated by the model to determine how well it simulates reality. “The problem is that if you have a spill in some other area of the world, you probably aren’t going to have the kind of detailed information we have for Groves Creek,” said Alexander. After testing the model with the detailed Groves Creek’s profile, the model will be run multiple times while reducing the accuracy of the profile data. Blanton and Alexander plan to complete the study by mid-2012. If verified, the model could then be used to predict the way salt marshes anywhere in the world may be affected by a contaminant spill.